In winter many of my favorite salads don’t include lettuce. They are heartier, ressembling more of a comfort food while delivering a nutritional punch and tons of flavor. A salad need not be served cold. Keeping this in mind, the pantry holds so many delicious possibilities. 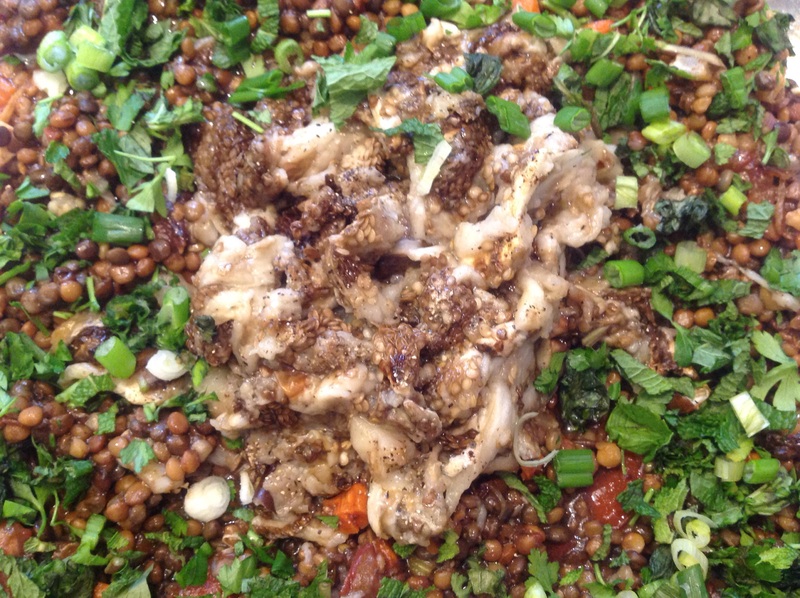 Magic happens when a vinegary dressing is introduced into warm grains or legumes. They come alive with big bold flavor. Toss in roasted vegetables and fresh herbs for brightness and you’ve got a hearty flavorful meal in a bowl. One of the most memorable lunches I ever had was also one of the simplest. It was a warm salad of lentils enjoyed at the Ritz Carleton Hotel in Philadelphia. 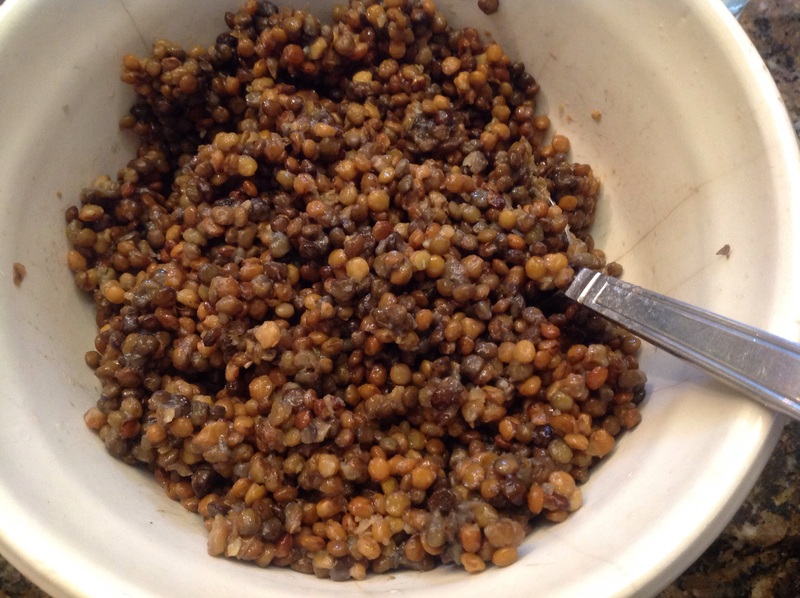 I have tired to recreate those lentils many times. This recipe comes pretty close to the sublime dish that warmed a cold day and mended a bruised friendship. In winter a rustic, warm salad is a great lunch option that feels both comforting but still nourishing. This salad combines cooked lentils with roasted vegetables, a handful of fresh herbs and a crown of creamy roasted eggplant. Topped with a dollop of cool lemony yogurt and served with warm pita, it is food of the gods. It may seem like there are a lot of steps to prepare but it is pretty straightforward and the individual steps can be made ahead and the salad assembled when desired. The secret is to combine the ingredients while they are warm to bring out the best flavor. Feel free to use whatever fresh herbs you have on hand and any prepared vinaigrette you have readily available. The same goes with the roasted vegetables. Roasted peppers or squash would be a good substitute for the eggplant. 2 cups of cooked small lentils prepared according to the package directions. For a boost in flavor, add a bay leaf and some sprigs of thyme to the cooking liquid along with chunks of carrots, onions and celery. Remove the vegetables and herbs once the lentils are done and keep warm. In a rush, the Trader Joe’s vaccum packed prepared lentils are an excellent time saver and can be heated in a bit of broth. VINAIGRETTE: 3 T balsamic vinegar; 1 shallot, minced; juice of 1 lemon; 1/2 c olive oil; salt and pepper. Wisk the oil into the other ingredients to emulsify. 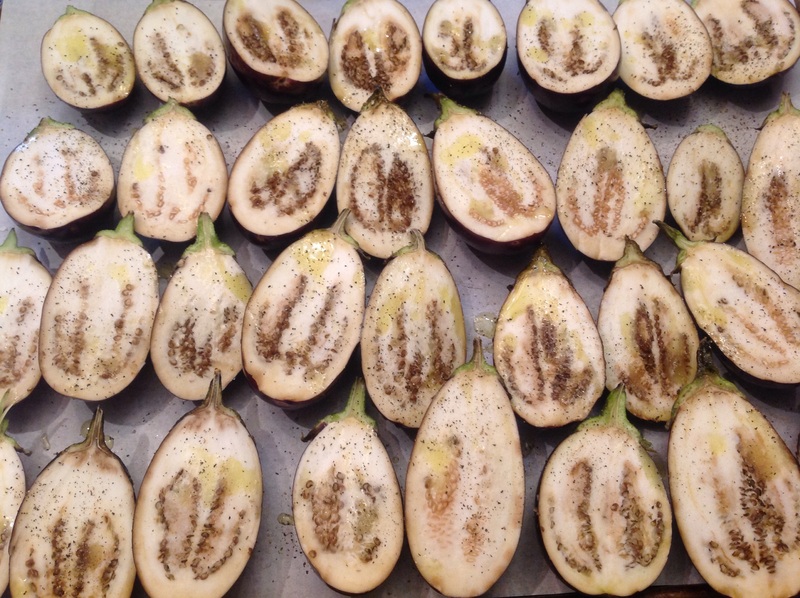 Preheat oven to 400 F. Cut your eggplants in half and drizzle with a bit of olive oil and season with salt and pepper. 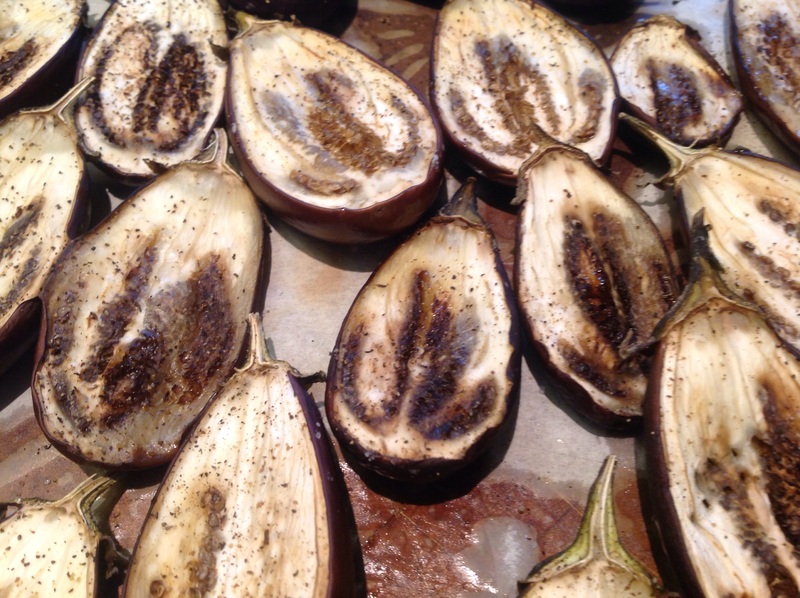 Roast for 20 minutes until eggplant is fork tender. Remove from oven and cool just until it can be handled. Scoop out the flesh into a bowl and season with more salt and pepper. Keep warm. 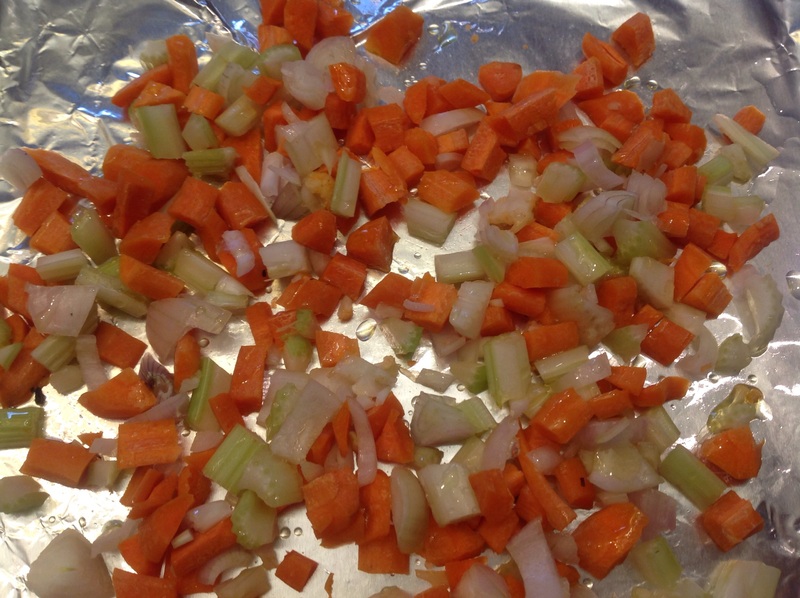 On a separate baking sheet, roast the diced carrots, shallots and celery with a tablespoon of oilive oil, for 15 minutes. This can be done at the same time as the eggplant is cooking. 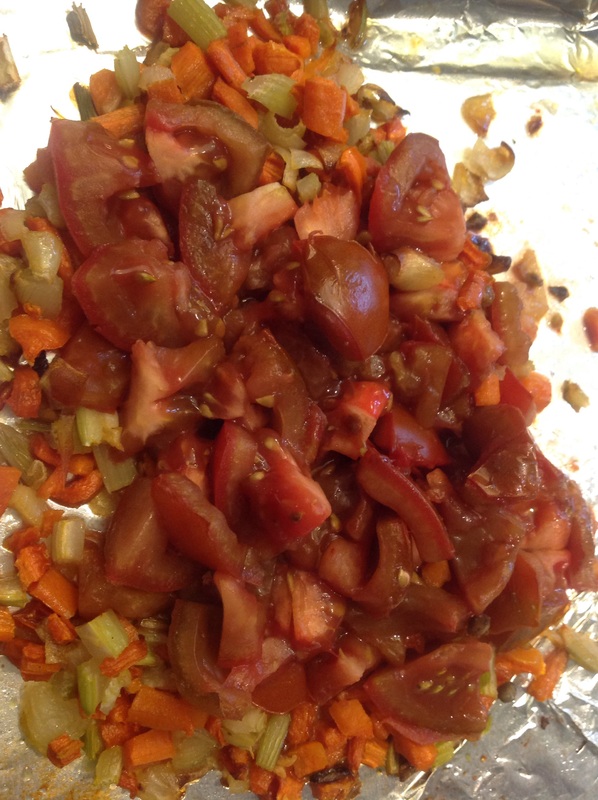 Remove from the oven, add the chopped tomatoes and return to oven for an additional 5 minutes. Add these warm vegetables to the cooked lentils and toss with about half of the vinaigrette. Keep warm. The rest of the vinagrette can be reserved for another use. ASSEMBLY: On a platter layer the seasoned lentils. Sprinkle with the herbs and scallions. In the center, mound the roasted eggplant. Top with the lemon yogurt. DIG IN! Serve with warm pita wedges. 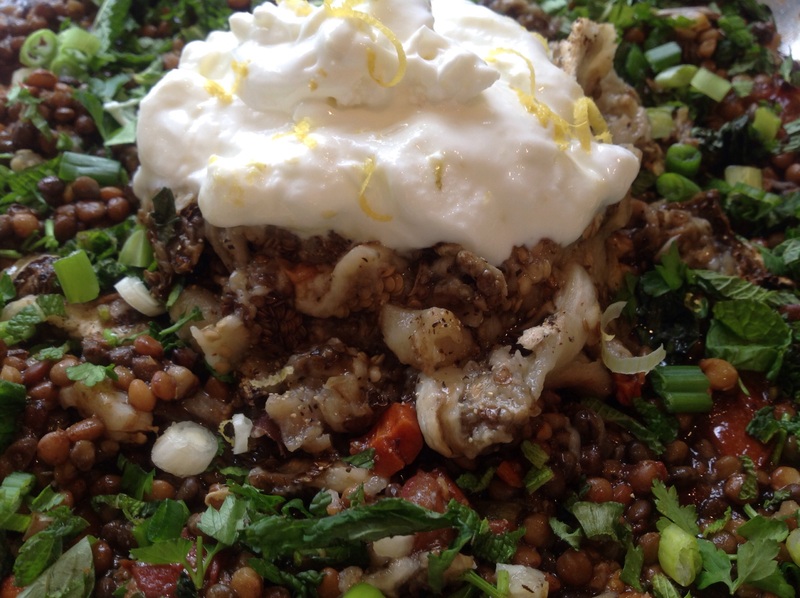 This entry was posted in Recipes and tagged roasted eggplant and herbed lentil salad, Roasted eggplant and lentil salad by Johanne Lamarche. Bookmark the permalink. Thank you Ginger. It really was delicious. I loved adding the tomatoes just at the end to warm them, get their juices flowing but keeping them tasting fresh! Renate, whom I know has connected with you, and I have a 99yr old German friend who eats kumatoes daily on brown bread and she tells me that is one of her secrets to a long life! Hope you can find those delicious tomatoes in the UK. Such a sad sad email Ginger:(((( garden tomatoes are sooooo good! Do try to find Kumatoes in winter. I think they are imported from Holland. i once had this, but i flame charred the eggpant instead roasted it, it’s damn delicious!! 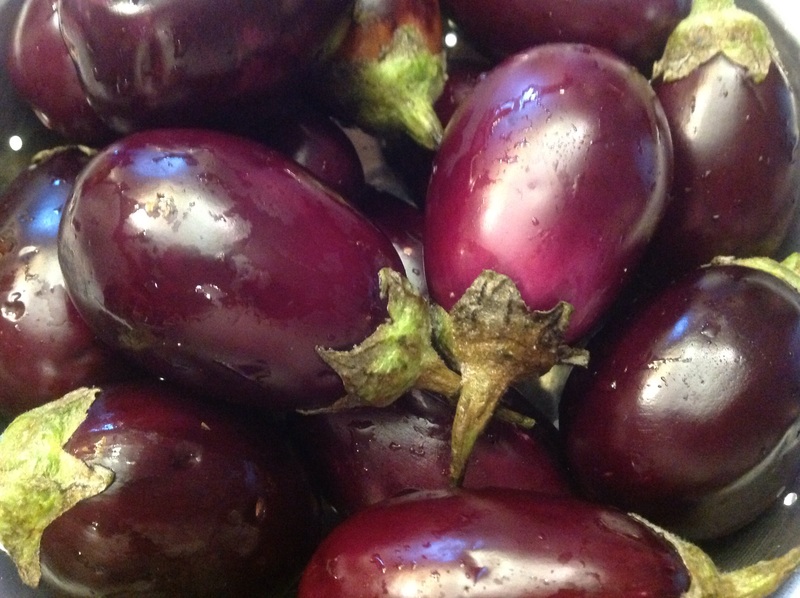 Do you use the small eggplants or large ones? Flame charring makes it easy to get the skin off. Good to hear from you Doc! That would make sense Dedy. Thanks.